It seems like a given that social marketing, a vehicle for engagement with an audience, should be fun. However that seemingly obvious fact can easily get lost in the shuffle of metrics, click rates, marketing plans, and C-suite approval. But when the fun is lost, so goes the incentive for your audience to engage. If YOU are not having fun, then they will definitely not have fun either. Jarrod Lyman brings a refreshing perspective to social that keeps enjoyment of life and his product at the forefront of his mind. It doesn’t hurt that his product is a beautiful swath of land in Oregon that provides endless outdoor entertainment and is capped off with the breathtaking peak of Mt. Hood. But beyond that, at the heart of his approach to social, is an understanding that if you don’t want to do it—whatever “it” is—neither will your audience. 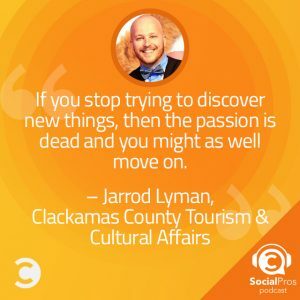 Through his social-focused lens, Jarrod has transformed tourist marketing into a career that positively impacts his life, his community, and his brand. In social, it’s important to be real and love what you do. Passion comes through in anything and that is especially true with social. People can sense BS a mile away so be real, be authentic, and care about what you’re saying. Unfortunately Jarrod doesn’t speak the same language as Bigfoot. So in absence of that choice, he’d go with Kevin Smith. Having just seen him perform live and experienced his passion for what he does in real life, Jarrod would jump at the chance to speak with him one-on-one to learn more about his approach to what he does, absorb some of that passion, and find ways to apply it to his own life.